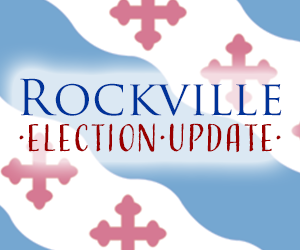 The 2015 Rockville election will return Bridget Newton as Mayor and Beryl Feinberg, Julie Palakovich Carr, Mark Pierzchala, and Virginia Onley to Council for the next four years, beginning on November 16. Of the 40,749 registered voters in Rockville, there was a total of 6,343 ballots cast (15.57 percent) including votes cast on early voting days, same-day registration at City Hall on Election Day and by absentee. That’s slightly lower that 2013, which had a participation rate of nearly 17 percent. 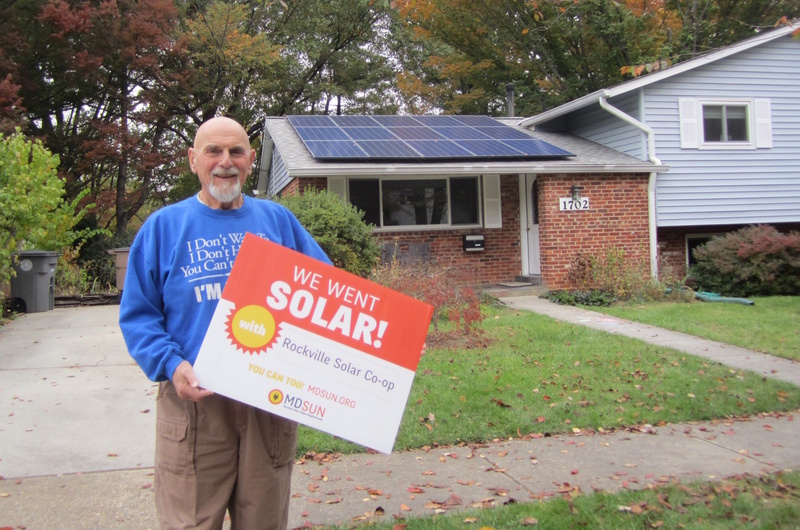 Norman Braverman installed a solar array on his split-level house in Rockville last week, making him the first of fifty in Rockville’s Solar Cooperative. Looks great on his house! (doesn’t he look like a proud homeowner?). Before he’ll be able to collect solar energy, though, he’ll need to complete inspection by the County and permission to operate from Pepco. More than 200 people are part of the co-op with 171 members seriously considering a proposal–it’s a major shift in attitude about energy and sustainability in Rockville. Thanks again to the Rockville’s Environment Commission for making this happen! (disclosure: we’re going solar, too!). Comus Market in northern Montgomery County, about a 20-30 minute drive north of Rockville. 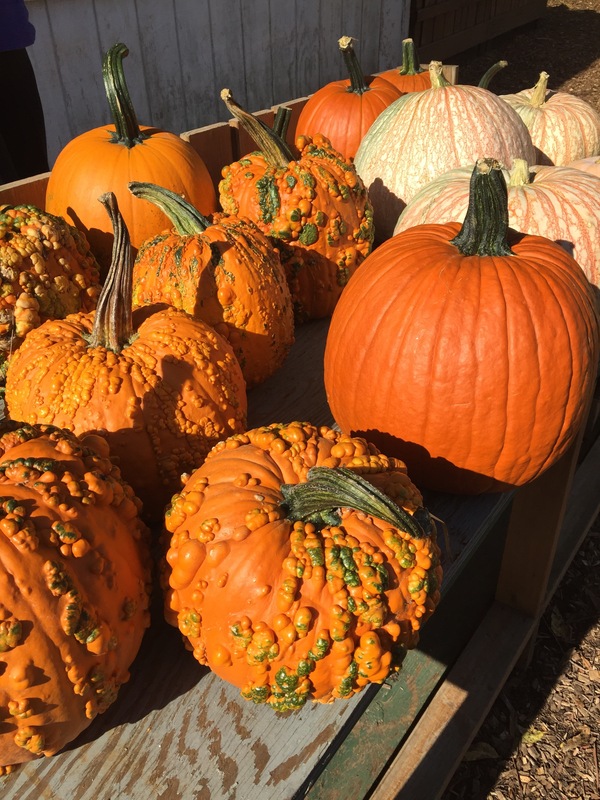 At the corner of Old Hundred Road (109) and Comus Road across from the Comus Inn is a small shed surrounded by tables and bins filled all sorts of strange and wonderful pumpkins and winter squashes, like Blue Hubbard, Sweet Dumpling, or Long Island Cheese. Although these unusual varieties are now appearing in grocery stores like Trader Joes, what you don’t experience is the drive out in the country and a chance to meet David Heisler, the farmer that grows them. A bit further up Comus Road is Sugarloaf Mountain (a short hike for a family) and Sugarloaf Winery (bring a picnic). Lake Bernard Frank on Avery Road on the east side of Rockville. It’s actually a water reservoir that feeds into Rock Creek but it’s also a park for walkers and hikers. One side of the lake is a paved trail and on the other an unpaved one. Even on Sunday afternoons it’s so quiet that you might only encounter a dozen people. No playgrounds, playing fields, boating, or restrooms but there are picnic tables near the parking lot. Many of my friends love visiting Butler’s Orchard in Germantown because they have children who like the pick-you-own experience. Apples, tomatoes, raspberries, cherries, peas, potatoes, and flowers have passed but you can still pick you own pumpkins and enjoy a dozen different pies from their bakery (including such unusual flavors as apple caramel walnut, blueberry lemon bucket, and strawberry mango). Weekends gets far too busy for me but your kids will love it. If you have a favorite place where you enjoy fall in or around Rockville, please share it in the comments below. October 1 was the deadline for the first financial reports in this campaign season with the second one due October 26, just a few days before the November 3 election. Financial reports are a result of unfair election tactics and political corruption, and indeed, while most voters feel that money has a bad influence on politics, fundraising is a crucial aspect of campaigning, even here in our hometown of Rockville. As I mentioned in a previous post, the cost of a campaign is high, especially in mayoral races. Rockville’s election code has a lengthy section on campaign financing that outlines the requirements for a treasurer and record-keeping; acceptable expenses, contributions, and loans; and restrictions on campaigning by people who are not candidates. At times, these requirements and limitations seem onerous or archaic, such as prohibiting “payment for walk-around services.” Aren’t the days when thugs were paid to hustle people at the polls to gain a vote or to intimidate opponents long gone? 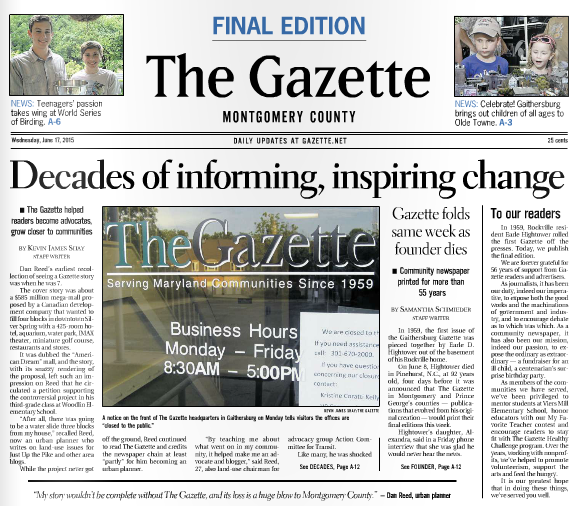 Yet in 2003, the Maryland Court of Appeals reviewed a case that accused the Ehrlich/Steele gubernatorial campaign of hiring high school and college students along with 200 residents of a homeless shelter to “accost voters” outside the polls and urge a “voting preference.” The 2013 election campaign in Rockville involved several questionable tactics and since then the Board of Supervisors of Elections has clarified the Election Code to close some of these loop holes (e.g., no statements and materials may be distributed anonymously, even by individuals). The Stanford Grill restaurant opens Monday, September 28 at 2000 Tower Oaks Boulevard (south of Wooton Parkway near I-270 in one of DC’s “healthiest buildings“) in Rockville. This will be the second Stanford Grill for the Blue Ridge Restaurant Group, which also has four Copper Canyon Grill restaurants. Lunch and dinner are served Monday through Thursday from 11 am to 10 pm, Friday through Saturday from 11 am to 11 pm with Sunday brunch served from 10 am to 2 pm and dinner until 10 pm. For more information or for reservations, call 240-582-1000. The concept is “upscale casual” with a menu that emphasizes familiar comfort dishes including New York strip steak, pork chops, crabcakes, salmon, and chicken pot pie, along with a variety of sandwiches (burger, French dip, sauteed chicken) and salads (club, chicken, tuna, and steak). It looks like they have a full bar but the wine list needs a rethinking. “Other interesting whites” includes Berginer’s white zinfandel and Dom Perignon is listed among the champagnes. White zinfandel is not an interesting white and Dom Perignon is now such a cliche that it suggests they really didn’t think about their wine selections. Looks like this restaurant might satisfy the executives whose offices line the 270 corridor but it won’t appeal to foodies. The forums are free and open to the public; anyone is welcome to attend any or all of the forums. You not only can hear candidates discuss various issues but also talk with them before and after to learn more. If you support one of the candidates, they often have campaign literature or yard signs that you can take home or share with friends and neighbors. The Rockville solar energy cooperative is growing, sufficiently to the point that it looks like it’ll be able to solicit bids from installers in June. Maryland Solar United Neighborhoods (Maryland SUN), a nonprofit organization, is working with the Environment Commission of the City of Rockville to make solar energy more affordable and accessible. By using the collective buying power of a group of Rockville residents, we’ll save on the cost of installation (yup, my family has joined). If you’re interested in going solar but not sure where to start, this co-op is a great place to learn. At this point, there’s no obligation to purchase a system or have it installed, they’re just collecting names of homeowners who are interested so that we can obtain the best bids possible. Based on the same principle as buying in bulk, the group will go through the process of going solar together by working with a Maryland SUN to select a single installer. Each participant signs an individual contract with the chosen installer, but all participants get the group discount. After the installer has been chosen in August, it may not be possible to participate in this round. They’ve held two info sessions so far and the last is coming up on Tuesday, June 9 at 7 pm at Glenview Mansion. For more information and to sign up, visit MDSun.org or contact solarteam@mdsun.org.